At the same time, Moto Guzzi V7 II is a completely new bike in terms of technology, powertrain, ergonomics, safety, construction quality and finish and riding pleasure. 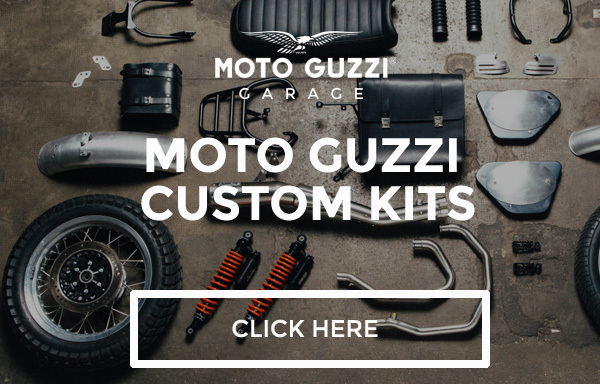 Moto Guzzi V7 II also marks a decisive turning point in the quality and wide range of Moto Guzzi accessories. But that's not all: another extremely important aspect was the design and development of numerous parts in order to allow each customer to personalise his or her V7 to the extent that it becomes a true "special" in the most diverse interpretations, from the Dark Rider to the Scrambler, from the Legend to the Dapper. This multiplies the V7 II exponentially with respect to the three standard versions and allows each Guzzista to create a completely unique, original and "tailor made" vehicles which is still entirely compatible with the basic version. This is a new Moto Guzzi strategy that confirms the V7 as an extraordinary platform for the creation of special bikes, thanks in part to the enthusiasm with which the greatest customizers in the world take on transformations of Guzzi models into unique, magazine cover works of art. Eclectic and essential, the V7 II Stone now has new colour schemes: nero “Ruvido” rosso “Impetuouso”, grigio “Intenso” and giallo “Denso”. They are all satin finishes and inspired by typical ‘70s colour schemes that enhance the contrast of the new frame, built with more aesthetic welding where brilliant paintwork has been applied to enhance the ingenious architecture. The rest of the bike, from the mirrors to the shock absorbers, from the mudguards to the wheels and even the side panels is dominated by black, now also extended to the tail light assembly and the new brake and clutch levers. This is a look that enhances the chromium on the silencers, the instrument cluster profile, the shock absorbers and even the tight finning of the engine's aluminium cylinders. The technical characteristic that differentiates the V7 Stone from her big sisters is the lightweight alloy wheel rims, a unique modern concept on a decidedly vintage design. The Moto Guzzi V7 II was born out of the radical and energetic work done on the engine and the chassis where every possible path was explored to increase the level of safety, ergonomics and comfort - in short, the pleasure of riding. It's not just an expression, the V7 truly has an extra gear. All it takes is one look at the completely redesigned gearbox that completes the engine revamping launched in 2012 with the thermal part, electronic management and the fuel system, continued this year with a new alternator and the introduction of forced lubrication with an oil pump. The primary drive ratio has also been changed, going from 16:21 to 18:23. Along with the gearbox the clutch was also improved, with modifications to the lever, the linkage and the cable in order to achieve a softer action and a more even release. Moto Guzzi has always been at the top of its game when it comes to safety aspects as well. The 1973 V750 S was one of the first bikes in the world to have dual front disc brakes, followed by the S3 with a disc on the rear as well. In 1975 the Moto Guzzi 850 T3 introduced combined braking, called “integral” used through 2011 on the California ’90 Anniversario. The purpose of this device was to reduce stopping distances and dynamic stability in braking - basically an pioneer ABS system. Today Moto Guzzi continues developing solutions to increase active safety for the rider and on the V7 II the ABS and MGCT (Moto Guzzi Controllo Trazione) systems are introduced. Once you are in the saddle, lowered to 790 mm from the previous height of 805, you'll discover how the new saddle-handlebar-footpegs triangulation transmits the pleasant sensation of being in the bike and not on top of it like with the previous version. The new riding position also allows you to fully enjoy the changes made to the chassis which, thanks to the new lower and farther forward position of the engine, have made it more communicative and efficient in demanding riding.